A few weeks before my 40th birthday we were approached by English Dream Cake of Paris and asked if we would like to review one of their luxury cakes. It was great timing and seemed like a lovely way to celebrate my special occasion in style. I'm not a party animal and I was planning a simple, low key garden party at our house with a bunch of my closest friends and their children. An elegant cake would make the perfect centrepiece for us all to admire, taste and (hopefully) enjoy. Beforehand Cheryl from their 'Dream Team' arranged a tasting session for Five Little Stars to help me to choose the cake flavour and filling. We involved our children and made it into a Teddy Bear's Picnic. It was a really fun afternoon. (Prices are separate for tasting sessions so you would need to enquire). What impressed me from the beginning was Cheryl's professionalism and her eagerness to get it just right for me. After nibbling on a few cupcake flavours I ended up choosing Vanilla bean cake with lemon delight buttercream. Next, I was asked to choose my dream cake style from some ideas on the English Dream Cake Facebook page (they have a website coming soon). I was very taken with the marble effect icing that I had seen on a few of their wedding cakes and, because it was a garden party, I also liked the idea of floral theme but I couldn't decide. So I asked Cheryl and the team to use their expertise and surprise me! My only request was that it be simple and stylish. Cheryl confirmed the week before and again the day before the party which was very reassuring. What I like about the service offered by English Dream Cake is that they can chauffeur deliver the cakes (within Paris and the Ile-de-France region). When organising a party at home there is enough stress making sure bedrooms are tidy, eyeliner is straight and carrots are chopped before having to rush off in a frazzled state to collect a cake. I felt so relaxed knowing, with confidence, that the cake would arrive. On cue, Cheryl appeared at our gate with cake in hand. The stunning two tier cake arrived fully assembled and wrapped by Cheryl from English Dream Cake. The story behind English dream cake is fascinating. Cheryl (above) is a mother of 4 and is originally from the island of Dominica in the Caribbean where her father was once Prime Minister. As a teenager she was so intrigued by the beautiful cakes on display at her parent's many formal gatherings that baking soon became her hobby. Cheryl has been in Paris for 7 years where she worked in childcare. This is how word spread of her cake making skills after she started making cakes for children and their parents. She also realised there was high demand for cakes decorated and made in an English way (French celebration cakes tend to be more understated: normally a dense chocolate torte with no icing). She has now teamed up with 3 other bakers including her daughter who is an artist at heart and an interior designer by profession. Time for a quick photo before the reveal! As a little surprise, if you spin the cake around to the other side, they added a topper (of me!) wearing a discrete little 40 badge (they must have guessed I'm a no fuss kind of person). But if you DO want fuss and bling that's fine too. English Dream cake can do pretty much anything you desire! And they can do much smaller cakes and cupcakes for children's parties too. My guests, young and old, were all really impressed by the stunning design. It certainly had the wow factor. I'll start by saying I'm not a food critic but I can tell you honestly, as lovers of cake, what my friends and I all thought. We all agreed it was delicious. Everyone finished their slice to the last crumb! The cake was moist and rich with a hint of lemon. I'd describe it as cross between a Victoria sponge and an American mudcake. I think this two tier cake could have easily served up to 100 people (we had huge slices but you could cut them much smaller as you don't need a lot to feel satisfied). The icing was just right. It had a soft, almost "gooey" quality that wasn't too sugary. Normally I'm not a fan of hard fondant icing on cakes so this was perfect and so edible. My friends were shocked when I told them afterwards that the cake was 100% Gluten Free. None of them guessed. Sometmes gluten free cake can be crumbly with a powedery aftertaste but this cake was the opposite - so moist! I know this because my mum is gluten intolerant. In fact, all English Dream Cakes are gluten free (which really takes the hassle out of having to buy two cakes as we did for our wedding). Also, there is no gelatin, no glycerin and no added preservatives. Cake for events birthdays, baby showers etc. start from €75 (delivery is extra). Mini treats: cupcakes, cookies, cake pops and mini cakes (from €2 - €15). Delivery possible for orders over 24 cupcakes. Their wedding cakes (which include a tasting session) start from €300 and delivery is included. My cake is an "event cake" with all the trimmings for the purpose of this review so I could see what the Dream Team is capable of. Although it looks like a 2 tier cake, it's actually three levels inside! 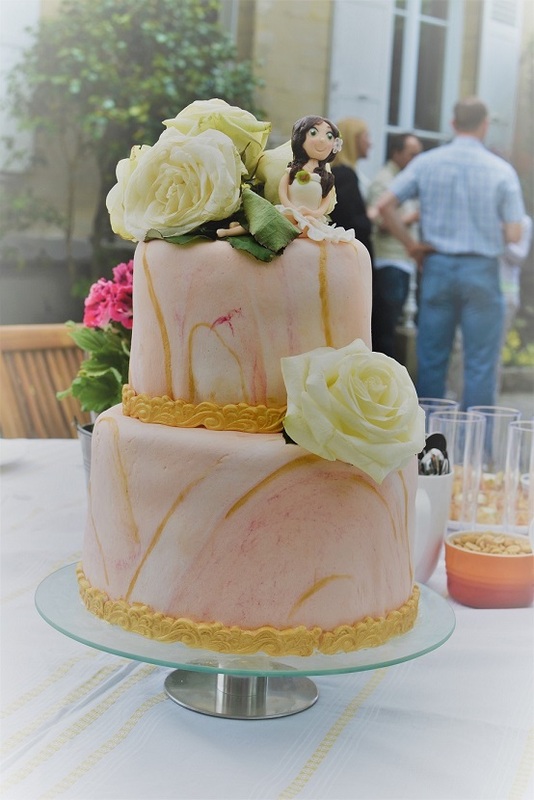 Based on the real edible gold paint, home-made marble fondant, edible topper, organic flowers, packaging (cake stand included), delivery and labour. It would cost 280 EURO (£240). * This is a collaborative post. I was given this cake to test in return for my honest review. All words and opinions are, as always, my own.